Announcement Loving designing and featuring unique wedding veil and accessories since 2002. Specializing in the use of fabrics, styles, colors, and unique trims to create distinctive styles for the modern bride. Shop by color for hard to find tasteful wedding accessories and veils. Check out "The Boutique" for specially priced items ready to ship. Loving designing and featuring unique wedding veil and accessories since 2002. Specializing in the use of fabrics, styles, colors, and unique trims to create distinctive styles for the modern bride. Shop by color for hard to find tasteful wedding accessories and veils. Just finishing up an order for a bride waiting on this beauty. 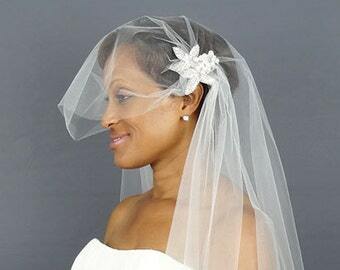 This wedding veil is so gorgeous and versatile. Adds a little "bling" to any look. 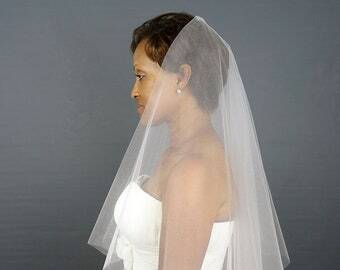 Still love this mantilla veil we designed years ago and still keep it in our collection. We call it "Autumn Leaves". Lace Mantilla Veil with Embroidered Lace in Leaf Pattern, Allover Lace Bridal Veil - "Autumn Leaves"
Our Real Bride: Featured editorially in "The Knot" Spring 2013 issue wearing our Swiss Dot Veil. Our Real Bride: We designed a French Alencon lace drop veil for this lovely bride who loved veil. Our Real Bride: Featured on "Brides" for her glam wedding wearing our birdcage veil. Our Real Bride: Wearing our All-Over Embroidered Laced wedding veil. 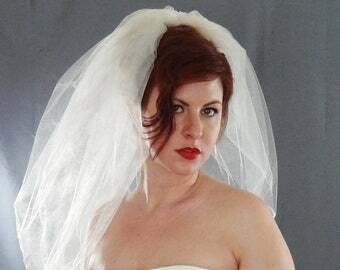 Our Real Bride: Looking sassy in our long birdcage veil for her special day held at the San Francisco court house. 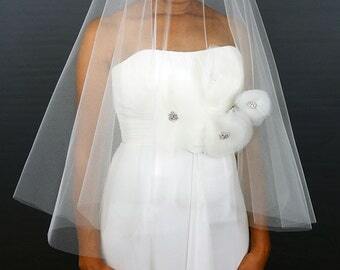 Helping Brides Make a "Statement" on Their Wedding Day...Unique Wedding Veil Styles. Distinctive Veils & Accessories has been proudly designing unique wedding veil styles since 2002. We love coming up with creative new design concepts using a variety of veil materials, imported laces, trims, and components to create a distinctive look for the bride seeking something different. Our eye for detail, design, and style has resulted is our being recognized by major magazines over the years with our veils and accessories being editorially featured in major bridal magazines such as "Brides", "The Knot", and "The Bride and Bloom" magazines. We have had the pleasure of designing bridal veils for the every day bride as well as several celebrities in film and TV, music, and sports over the years for their special day. It's been a wonderful journey. Keep checking back with us for new designs and styles as we continue to keep up with current trends to provide something unique and different for the heirloom bride. See our reviews and videos at weddingwire.com. We are proud to have won the Bride's Choice Award from WeddingWire for 2013, 2014, and 2015! Veil Designers that assist us in new designs. Helps us create new looks for beaded veils and lace veils. 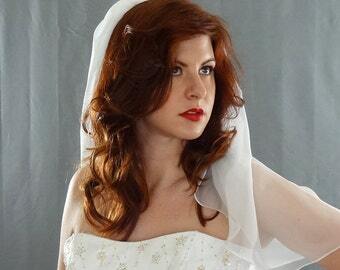 Our partner designs and creates our beaded and embroidered veil collection and collaborates with us on new designs. They help to create the physical designs. Welcome to Distinctive Veils & Accessories Etsy Shop. We have been in business since 2002 creating beautiful custom veils and specialize in designing high-quality couture bridal veils using luxury fabrics, imported laces, and unique trims. Custom request are welcome!